Fans of Elizabeth Strout, rejoice. She has compiled a book of loosely connected short stories that center on the small town where Lucy—main character of My Name Is Lucy Barton—grew up. Slim but vivid, Anything Is Possible places the reader in rural Amgash, Illinois, where the sense of place is so convincing that we can almost hear the cornfields rustle. We meet an array of characters who (mostly) try to relate to others in spite of the heavy loads they carry, including a mother who leaves her adult children and moves to Italy, a school janitor who revisits a long-ago tragedy, and a bed-and-breakfast owner who gets too attached to her guests. In Anything Is Possible, Strout examines the relentless scuffle between what we think we are going to get out of life, and what we actually receive. For her characters, this contrast is both disturbing and liberating: “You never knew anything, and anyone who thought they knew anything—well, they were in for a great surprise.” While some of her characters are more relatable (and likeable) than others, all of them succeed in giving us a jolt. 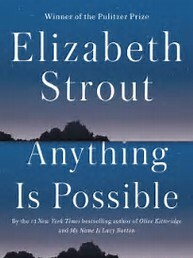 Anything Is Possible is written in Strout’s gorgeous, trademark language: spare, unobtrusive, and simple. As with My Name Is Lucy Barton, she relies on a good deal of white space in her prose, not giving us everything at once (or at all). Whether or not the reader embraces this sense of restraint, Strout can be commended for creating so much raw and beautiful life on the page. Mom, fundraiser, blogger and ardent reader, Laura loves literary fiction, memoir, essays—and helping people find their perfect book.